Chicago Teachers Union files lawsuit to defend Sarah Chambers | Fight Back! CHICAGO, IL- The movement to ‘Let Sarah Chambers Teach’ has grown since her May termination from Maria Saucedo Academy. An online petition calling for her reinstatement has gathered nearly 4000 signatures; a support rally organized in April drew a crowd of over 100, and 28 aldermen have re-leased letters of support for the educator. This public pressure from her students, supporters and fellow teachers has now crossed over into the legal arena. 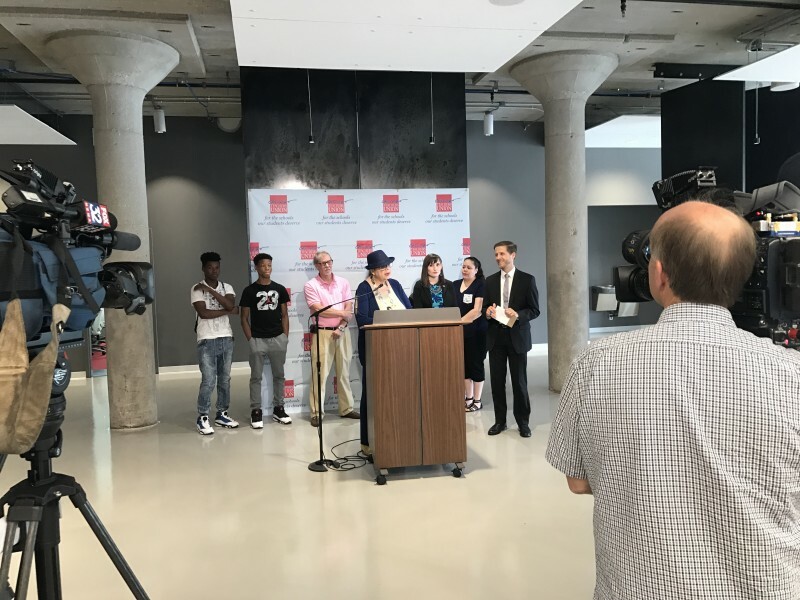 On July 7, the Chicago Teachers Union (CTU) filed a federal lawsuit against Mayor Rahm Emanuel and the Board of Education for retaliating against Sarah’s First Amendment rights to speak out against policy decisions that harm special education. Chambers has also filed a charge with the Illinois Department of Human Rights, according to her lawyer Josiah Groff, to investigate whether her sexual orientation played a role in the Board’s decision. Sarah is an openly LGBTQ educator and sponsor of Saucedo’s Gay/Straight Alliance. 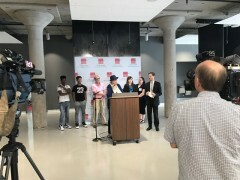 In a press conference held the same day announcing the lawsuit, CTU President Karen Lewis said "She has never been disciplined for advocacy in the past. Now, all of sudden, she is the world's worst per-son.” Countering the allegations made by CPS when they terminated Chambers, CTU President Lewis noted that, “Sarah is a devoted teacher that knows the law." Chambers has been active in the union since she began teaching at Saucedo nearly eight years ago. She is the chair of the CTU Special Education task force and a member of the House of Delegates. She is one of the most well-known and militant rank-and-file educators in the CTU. While this is an attack on Chambers and her students, clearly it is also an attack on the CTU. Chambers has spoken out against Mayor Emanuel and the Board of Education for their unfair treatment of stu-dents with disabilities, as well as Black and Latino students in the Chicago Public School (CPS) system. She has complained about the injustices in the classroom at multiple school board meetings, in front of board administrators. She has also organized students and teachers to attend these meetings and ex-press their frustrations with the education system. Being an outspoken union leader and unapologetic advocate for special education has made Chambers a target by CPS. The lawsuit alleges that Chambers has been targeted by Saucedo administrators since January because of her concerns about classroom sizes being in violation of Illinois law, and the admin-istration not meeting the requirements mandated in students’ Individualized Education Plans (IEPs). Additionally, Chambers is a distinguished teacher. She was rated as ‘excellent,’ the highest available rating, by school administrators two school years in a row. She’s never faced criticism for her performance in the classroom. “I love my students, I care deeply about my students and their education and their social and emo-tional well-being, " said Chambers during the July 7 press conference, "If Rahm Emanuel and CPS truly cared about our students with disabilities, they would immediately reinstate me, separate the co-mingled special education/general education funds, and fully fund special education." Breaking News: As Fight Back! was preparing to publish this article, CPS conceded to the CTU demand to separate the co-mingled special education and general education funds. Watch Fight Back! for analysis of this development.